Especially designed for Nokia users to enjoy video on Nokia, 4Easysoft Nokia Video Converter provides you the ability to convert all popular video formats like MOV, MPEG, WMV, AVI, MP4, MTS, FLV, VOB, MKV, HD videos to Nokia supported video formats. Also you can get audio from video to Nokia MP3. In addition, 4Easysoft Nokia Video Converter has powerful advanced features for you further edit your Nokia video. You can change the video effect, length, size, play screen and add watermark. Also it enables you to setting video and audio parameters for output Nokia video. 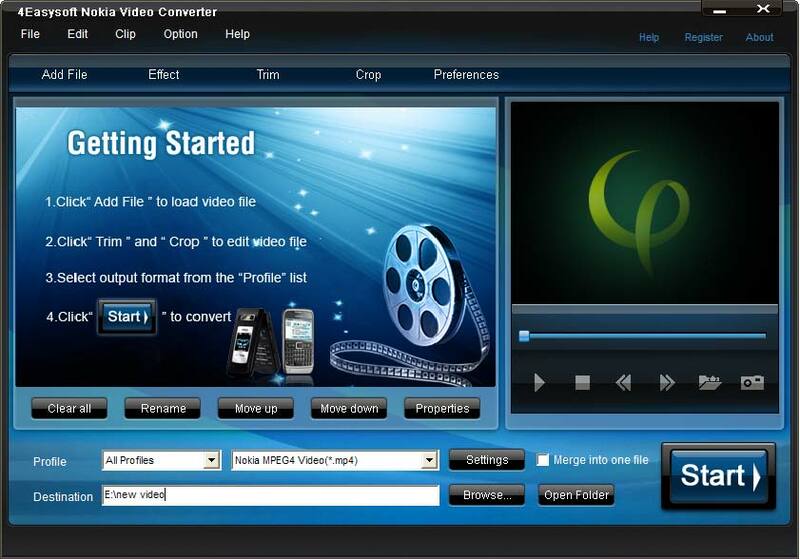 The Nokia Video Converter allows you to convert part video from the source video. Professional functions for you to adjust the video brightness, contrast and saturation to change the video effect. 4Easysoft Nokia Video Converter can help you change the video length by trimming video parts and merging video chapters together. With the "Crop" function, the Nokia Video Converter can help you remove the black edges and adjust the video aspect ratio and zoom mode so as to make the output video fit your Nokia screen. This Nokia Video converter allows you to add text/image watermark to Nokia video and adjust the position/transparency of watermark. You can attach audio track and subtitle for output Nokia video from the drop-down list on the interface. An intuitively designed user interface brings you more convenience and enjoyment for converting video to Nokia. With professional video encoding and decoding technique, 4Easysoft Nokia Video Converter can help you convert video to Nokia with high quality and fast speed. With the built-in player, 4Easysoft Nokia Video Converter enables you to preview the source video and output Nokia video. Also you can take pictures of your favorite image when you preview.